This is the sixth in a six-part series that uses FanGraphs' Steamer600 projections to look at how prospects would fare over a full Major League season. The system bases its forecast on 600 plate appearances for position players, 450 plate appearances for catchers, 200 innings for starting pitchers and 65 innings for relievers -- taking into account age, past performance and previous Minor League levels, among other factors. It's a struggle to find a team with fewer holes than the Dodgers. Of course, that's easy to say about a team that finished the regular season with a 104-58 record, won its division by 11 games and fell one win shy of the franchise's first World Series title since 1988. But there's a reason why Los Angeles hasn't been a huge factor this offseason. The club's biggest moves have been taking on Matt Kemp's salary in a trade with the Braves that rid the Dodgers of the contracts of Adrian Gonzalez and Scott Kazmir and another deal with the Royals for controllable left-handed reliever Scott Alexander. And yet while other clubs add reigning MVPs and former No. 1 overall picks, the Dodgers are still projected for 94 wins, according to FanGraphs, making them nine-game favorites in their division again and the second-best team on paper behind only the team to which they lost Game 7 three months ago. That's an enviable position, and any prospect would love to be in an organization that looks set to win right away. But what does a packed Major League roster mean for outfielder Alex Verdugo and right-handed pitcher Walker Buehler, two prospects already with Major League service time who otherwise could be competing for Opening Day jobs in The Show? According to Steamer, there's still some good to be found in their expected trips back to Triple-A Oklahoma City. Start with Verdugo because his case is much more cut-and-dry. The 21-year-old outfielder was a standout hitter in the Pacific Coast League last season, hitting .314/.389/.436 over 117 games at age 21 at the Minors' highest level. He didn't hit for much power with only six homers in that span, but the overall hit tool impressed, especially since he walked more times (52) than he struck out (50). He also showed off an extraordinary arm in racking up nine outfield assists -- all of them from either center or right field, though he did get in nine games in left as well. The Dodgers saw enough of Verdugo to select his contract when rosters expanded on Sept. 1, but he only got sporadic playing time, going 4-for-23 (.174) with a homer in 15 games. Despite Verdugo almost a full season at Triple-A, Steamer firmly believes he could use more development at the level, especially when his projections get compared to those of his potential outfield competitors. These are the Steamer projections for outfielders currently on the Dodgers' 40-man roster (not including Cody Bellinger, who is expected to move back to first base). So even if the Dodgers could find a taker for the $43 million Kemp is owed over the next two seasons, Verdugo is perhaps the sixth-best option for the L.A. outfield come Opening Day. That almost certainly means a return to Oklahoma City, and that's OK because there the 2014 second-rounder can round out his profile by focusing a little more on power with an eye on his second double-digit-homer season of his career. Don't get it wrong. With his hit tool and defensive ability, Verdugo has a chance to break through the established order on the grass in Chavez Ravine. But as Steamer shows us, he's not there yet, even with his record of success in Triple-A. Buehler's case is more complicated. The 2015 first-rounder was still recovering from Tommy John surgery in what was meant to be his first full season. So the Dodgers kept him on a tight leash, limiting him to a handful of innings each start and 88 2/3 frames in total in the Minor Leagues. But they also allowed the 23-year-old right-hander to show off his arsenal, which includes a high-90s fastball, a plus-plus curveball and a good slider, and he dominated because of it. 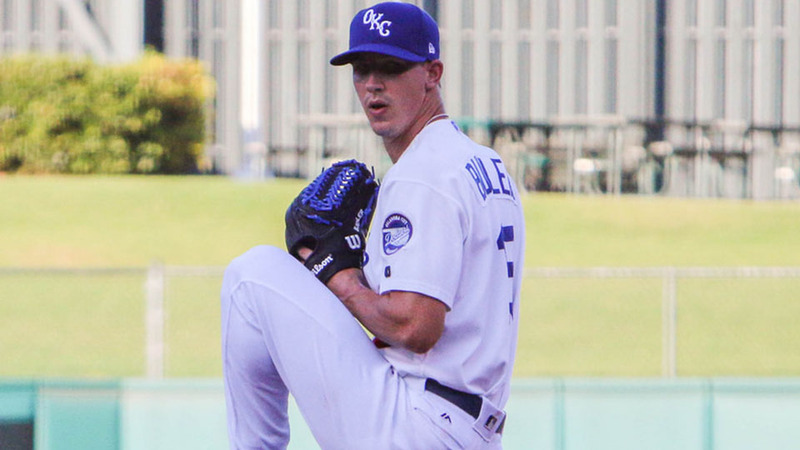 Buehler started the season at Class A Advanced Rancho Cucamonga, and like Verdugo, was in the Majors for September roster expansion, having posted a 3.35 ERA with 125 strikeouts and 31 walks in 88 2/3 innings at Class A Advanced, Double-A and Triple-A. In order to keep his innings limited, the Dodgers used Buehler exclusively out of the bullpen in the Majors, and he struggled, giving up eight earned runs on 11 hits and eight walks while fanning 12 in 9 1/3 frames. Steamer isn't overly worried about those first missteps in the big leagues. What it does take into account is the role he played in The Show. When it comes to pitching or even a defensive role, the projection system tends to rely heavily on what happened to the player in the Majors. In this case, it doesn't care that 19 of Buehler's 28 appearances in the Minors were starts. Nor that Dodgers brass has said all winter that Buehler will be groomed as a starter this spring. It noted all eight of his Major League appearances came out of the bullpen and gave him a reliever projection. That may make some roll their eyes and easily dismiss this projection, but consider just how good it is, especially compared with those of other notable Dodgers relievers. In essence, Steamer thinks Buehler could be an elite setup man for one of the game's greatest closers if the Dodgers made him a reliever on Opening Day. Of course, organizations shouldn't just move dominant right-handers with three potential plus pitches into shorter service just because a projection system said so. Buehler's ceiling is still much too high to consider that route. But if the Dodgers were still looking to keep close tabs on Buehler's innings, they could do so and reap potential major big league rewards by opening him in the bullpen with an eye on lengthening him out as the season progresses. The Dodgers don't have a huge starting pitching hole right now with Clayton Kershaw, Rich Hill, Alex Wood, Kenta Maeda and Hyun-Jin Ryu filling the rotation and Stripling, Brock Stewart and Wilmer Font around for depth. That may be too much role-swapping for an impressionable young arm, but it's a course Steamer at least forces everyone to consider. Most ready: Verdugo and Buehler. Give it time: This is more of a call for civility. Yusniel Diaz and Yadier Alvarez dropped out of the Top 100 this offseason after uninspiring turns at Class A Advanced Rancho Cucamonga and Double-A Tulsa. Their Steamer projections reflect that with neither player even cracking replacement-level. And yet Alvarez will be returning to the Texas League as the age of a college senior and Diaz will do the same as a college junior. They've got time to figure out their woes, namely tapping into his power for Diaz and finding the zone with regularity for Alvarez. Wild cards: Edwin Rios would be interesting in most other systems. His 25 projected home runs are fifth-highest among Dodgers batters, and his 91 wRC+ is better than even Verdugo's. But Cody Bellinger is likely headed to first base full time, and no one's knocking Justin Turner off third base any time soon. (It'd certainly take more than a 91 wRC+.) He did make 11 starts in the outfield last season, but a 20-run tool does not a quality outfielder make. Elsewhere, Jake Peter was moved from the White Sox to the Dodgers in the same deal that netted them Scott Alexander from the Royals. The 24-year-old infielder's projections don't pop out, though he is one of two players listed above projected to hit double-digit homers and steal double-digit bases. Combine that with 107 career games of Triple-A experience, and his skill set could make a Major League impact in some role in 2018. Top-100 talent: Keibert Ruiz (No. 52) is the only Top-100 member yet to be discussed. The 19-year-old catcher shot up in the rankings after hitting .316/.361/.452 and showing promising defensive skills at Class A Great Lakes and Class A Advanced Rancho Cucamonga last season. However, he's still at least a year away and his Steamer projections reflect that. Most ready: Jimmie Sherfy posted a 3.12 ERA and a 0.96 WHIP with 61 strikeouts and 10 walks in 49 innings at Triple-A Reno. He didn't give up a single run and only allowed seven baserunners over 10 2/3 innings in 11 Major League appearances. It doesn't get much more Major League-ready than that. The 26-year-old right-hander, who averaged 94.1 mph on his fastball and relied heavily on his above-average slider in the Majors, is projected by Steamer to be Arizona's third-most effective reliever with Major League time behind Archie Bradley (3.42 FIP) and Andrew Chafin (3.59 FIP). Interestingly, left-handed prospect Jared Miller has similar projections and might have less competition with only Chafin and T.J. McFarland looking like possible southpaw options in the Arizona bullpen to begin 2018. Give it time: The D-backs had one of the strongest rotations in the game last season, and all five hurlers who made at least 25 starts (Zack Greinke, Zack Godley, Robbie Ray, Patrick Corbin, Taijuan Walker) are back with the club for 2018. Randall Delgado will also provide starting depth and Shelby Miller will return from Tommy John surgery at some point during the summer. As weird as it may sound, that's good news for Taylor Clarke. The 24-year-old right-hander impressed big time at Double-A Jackson, putting up a 2.91 ERA with 107 strikeouts in 111 1/3 innings, but struggled in six starts with Reno, where he had a 4.81 ERA, 31 strikeouts and eight home runs allowed in 33 2/3 innings. With a mid-90s fastball and solid grades on his slider and changeup, Clarke has the stuff to crack a Major League rotation at some point. He'll just need some time to fine-tune as Steamer shows with a 5.07 ERA and a 1.0 WAR projection over 200 innings. Barring more rough injuries at the top level, he should be afforded that time in 2018. Wild card: Anthony Banda had a rough go after entering 2017 as Arizona's top prospect, though he did make his Major League debut. The 24-year-old posted a 5.39 ERA with 116 strikeouts and 51 walks in 122 innings at Reno and had a 5.96 ERA with 25 K's and 10 free passes in 25 2/3 frames with the big club. When things are on, Banda has the stuff between a mid-90s fastball and a plus curveball to get upper-level batters out. That just didn't happen enough last season. Steamer gives him a reliever projection, and it's possible that's where his future lies if he can't find consistency in his return to the Pacific Coast League, especially with the likes of Clarke ready to pass him on the organizational depth chart. Top-100 talent: The D-backs took the slow route with Jon Duplantier (No. 73) in his first full season, sending the former Rice hurler to Class A Kane County to begin 2017. He ended up leading full-season Minor Leaguers with a 1.39 ERA between there and Class A Advanced Visalia while adding 165 strikeouts in 136 innings. Those are the types of mouth-watering numbers one would love to see get translated into Major League projections, even if they came at the bottom two rungs of the full-season ladder. Unfortunately, Steamer gave the 24-year-old right-hander a reliever projection. Don't look much into that. Duplantier has the four-pitch mix to stick as a starter, and he'll potentially get to climb a little more aggressively in 2018, hopefully starting at Double-A Jackson. Most ready: This is usually dedicated to a prospect who the projections expect to be ready for the Majors. In this case, it's a player everybody else expects to be ready, followed by an explanation on why Steamer might be down a bit on him. Ryan McMahon shot his way to the Majors in the second half last season, thanks to a breakthrough campaign in which he hit .355/.403/.583 with 20 homers, four triples and 39 doubles in 119 games between Triple-A Albquerque and Double-A Hartford. He was particularly good in the hitter-friendly Pacific Coast League, where he produced a .374/.411/.612 line in 314 plate appearances. The Rockies moved the typical third baseman around the infield, getting him time at first and second as well to get him unblocked by Nolan Arenado. Therein lies the rub. Most of McMahon's Major and Minor League experience last season was at first base. Therefore, Steamer gives him a first-base projection. The trouble there is the offensive bar for WAR is much higher. No doubt, Steamer expects McMahon to be an OK hitter over a full season, projecting him for a 91 wRC+ that ranks seventh among Rockies hitters. But it's not enough to even crack one win in WAR, given the positional adjustment. That said as things stand, Colorado still looks likely to turn to the 23-year-old left-handed slugger as its Opening Day first baseman unless they bring in a veteran free agent like Mark Reynolds to fill the role. McMahon's bat is ready to meet the demands of the Majors. Whether it's ready to meet the demands of a Major League first baseman is yet to be seen. Give it time: Projections of a .766 OPS, 17 homers and 1.3 WAR for a 21-year-old middle infielder will always raise some eyebrows in this space. The fact that they are associated with MLB.com's No. 15 overall prospect only heighten the intrigue. But no one expects Brendan Rodgers to have a big shot at cracking the Rockies' Major League roster for at least the first few months of the season. The 2015 third overall pick only played 38 games at Double-A last year and missed a good chunk of the season's final month with hamstring issues. The Rockies invited Rodgers to big league camp, and he'll get to measure himself up with Trevor Story and DJ LeMahieu before a likely return to Hartford. At some point, Colorado will have to figure out how Rodgers fits into a crowded infield, but as good as the projections look, that day is still a few months away at least. Wild card: Tom Murphy remains the ultimate wild card when it comes to Rockies prospects. The 26-year-old backstop has gotten Major League time in three straight seasons and looked like a potential catcher of the future coming off his monster 2016. But a fractured wrist limited him to only 50 games between Triple-A and the Majors last season, and he didn't quite produce up to his standards at either level when he was healthy. That was especially true in the big leagues, where he went 1-for-24 with nine strikeouts. Steamer doesn't think Murphy will be as good as 2016 or as bad as 2017, projecting him for 18 homers, a 70 wRC+ and 0.5 WAR. No one believes he'll compete with free-agent signing Chris Iannetta for the starter spot, but he'll have some work to do in the spring to show he can hold off the more defensive-minded Tony Wolters (61 wRC+, 0.4 WAR) for the backup role. Top-100 talent: Riley Pint, a 2016 first-rounder, squeaks in as the Rockies' other Top-100 representative at No. 100. The 20-year-old right-hander's fastball can measure up to almost anyone else's in the Minors. However, he showed some serious control issues in 2017, walking 59 in 93 innings at Class A Asheville, leading to a projection in which he walks more Major League batters than he strikes out. Pint's 2018 Major League prospects should have never been taken seriously, and this is only further evidence. Most ready: The Padres have one of the best and deepest systems in the game, having placed seven players on MLB.com's updated Top-100 list. However, it will be some time before that talent tree bears fruit in San Diego. None of the seven Top-100 representatives have played at the Triple-A level going into 2018, yet Steamer would like to see Luis Urias get a Major League look coming off his 118-game season at Double-A San Antonio last year. The 20-year-old middle infielder has one of the best overall hit tools in the Minors and showed it off with a .296 average, a .398 on-base percentage and a 65/68 K/BB ratio, despite being the Texas League's youngest player on Opening Day. Steamer doesn't see him hitting for a high average or any power right away, but an 83 wRC+ and a 1.3 WAR projection aren't much to sneeze at for a player who doesn't turn 21 until June. Carlos Asuaje (85 wRC+, 0.9 WAR projections) and Cory Spangenberg (88 wRC+, 0.6 WAR) won't be much more than second-base placeholders at Petco Park until Urias can break down the door from El Paso. Give it time: As bad as the Padres' Major League club is expected to be, it may be thinnest right now in its rotation. That might make it natural to turn to the prospect list to find a potential savior, and indeed, Cal Quantrill came in at No. 40 on MLB.com's updated list after finishing last season with eight Double-A starts. He could be a big part of the Padres' starting pitching future. But not its immediate future. Focusing exclusively on the projections, Quantrill's 4.90 FIP projection is only ninth-lowest among potential Padres starters. That would be a clear sign. And everyone needs to remember this is a right-hander who had Tommy John surgery in 2015 and was carefully managed to get his 116 innings last season. San Diego isn't going to rush the development of the 22-year-old, who receives impressive marks for his fastball and changeup, just to see him struggle with a rough team. A debut in the second half could be possible if Quantrill really proves himself back in San Antonio and up at El Paso, but his impact should be felt more in 2019 than 2018. Wild cards: From a strict projections standpoint, Franchy Cordero won't stand out. Sixteen homers and 14 stolen bases are fine counting stats, but his .242/.284/.400 line and 0.6 WAR won't move the needle. However, Jeff Sullivan at FanGraphs points out that Statcast shows us Cordero had elite sprint speed and a hard-hit rate that put him in a similar class with Aaron Judge and Giancarlo Stanton during his 30 games in the big leagues last season. It's a small sample, and a 44.4 percent strikeout rate that resulted in a .228 average and .278 OBP held Cordero back from truly showing off those skills, but it's an intriguing thought that San Diego's No. 12 prospect could force his way into the outfield alongside Manuel Margot and Hunter Renfroe should everything come together in 2018. The fact he was named Dominican Winter League MVP and Rookie of the Year after hitting .323/.393/.495 with five homers, five triples, seven doubles and six steals in 50 games certainly helps his case. Top-100 talent: No. 8 overall prospect Fernando Tatis Jr. is the only other member of the Padres' Top-100 contingent to have played at a level higher than Class A Fort Wayne, and even he only got 14 games in San Antonio at the tail end of last season. Michel Baez and Adrian Morejon were two parts of a fun TinCaps rotation by season's end, but only combined for 126 2/3 innings across all levels. Anderson Espinoza was meant to pitch at Class A Advanced Lake Elsinore, but never officially took the mound, and he's likely to miss all of 2018 after undergoing Tommy John surgery in August. MacKenzie Gore (No. 19) is the Padres' top pitching prospect and will be high-kicking his way into his first full campaign this spring, making a projection worthless at this point. It's an enviable group. It'll just be a while until they're on a Major League diamond together. Most ready: The Giants expect Tyler Beede to compete for a Major League rotation spot this spring. That's not usually what anyone would expect for a pitcher coming off a season with a 4.79 ERA in 109 Triple-A innings. Yet Steamer believes Beede could be a good bounceback candidate, even if he made the jump straight away. Among those with legitimate chances to crack the San Francisco rotation, Beede ranks fifth in WAR projection at 1.7 behind Madison Bumgarner (3.4), Jeff Samardzija (3.3), Johnny Cueto (2.7) and Chris Stratton (1.8) and beating out Ty Blach (1.3) and Joan Gregorio (1.1). (Fellow 40-man member Tyler Herb does check in higher at 2.0, but it's tougher to see him jumping the line having yet to pitch at Triple-A.) Now healed from a groin strain that limited him in 2017, Beede has talked about increased confidence entering the spring, and barring a move for a starting pitcher, the 2014 first-rounder could have the inside track to prove his PCL struggles were a mirage quite quickly. Give it time: There's no doubt the Giants like Chris Shaw's bat. It's a big reason why the organization moved the left-handed-hitting slugger to left field on a full-time basis last season. With more than 120 extra-base hits over his first two full years in the Minors, Shaw showed enough he's worthy of carving out his own spot in a lineup, and the easiest way to do that would be to get him out of Brandon Belt's shadow. However, there are many questions about his ability to provide defensive value on the grass, and for its part, Steamer still thinks he's got some more to prove with his bat with an 80 wRC+ projection. A first-round pick in 2015, Shaw isn't on the 40-man yet, and he'll have to keep building on his 88-game stay in the PCL last season if he's going to break through by the All-Star break, especially after San Francisco added Andrew McCutchen and Austin Jackson to the outfield mix. Wild card: Speaking of the outfield situation, Steven Duggar could very well earn himself a role in center as early as this spring. Jackson's two-year contract signing complicates things there, but it's possible the left-handed-hitting prospect could platoon at some point with the right-handed-hitting veteran. The main reason is the Giants like Duggar's chances to cover plenty of ground in a spacious AT&T Park. Unfortunately, Steamer hasn't seen his defense in the Majors yet and can't offer a projection on its potential value. It does offer that Duggar's bat is as ready as Shaw's, and if the Giants can get the most out of it by using Duggar mostly against right-handers while also adding some pinch-running opportunities, there's a good chance he's worth more than his 0.6 WAR in a full season. Top-100 talent: Heliot Ramos (No. 63) is the Giants' lone Top-100 representative on MLB.com's updated list. The Puerto Rican outfielder played only 35 games in the complex-level Arizona League, making any discussion of a Major League projection rather futile.